THERE is but one God whose name is true, the Creator, devoid of fear and enmity, immortal, unborn, self-existent by the favour of the Guru. The True One was in the beginning; the True One was in the primal age. The True One is now also, O Nanak; the True One also shall be. [1. The Japji is considered by the Sikhs a key to their sacred volume and an epitome of its doctrines. It is silently repeated by the Sikhs early in the morning. Every Sikh must have it by heart, otherwise he is not deemed orthodox. It is the duty of all Sikhs, even if they cannot read, to have themselves taught this eat morning divine service. The composition appears to have been the work of Guru Nânak in advanced age. 2. Karta purukh. It is perhaps not necessary to translate the word purukh. It means male or creative agency. The all-pervading spirit in union with a female element uttered a word from which sprang creation. 3. Saibhan is derived from the Sanskrit swayambhu, which we have found in this passage in a very ancient Sikh MS.
4 Gur Parsâd. We have translated these words in deference to the opinions of the majority of the Sikhs; but with several carried gyânis we have no doubt that they were intended as epithets of God--the great and bountiful. Guru Nanak had no human guru; as we have already seen, his guru was God. It was during the spiritual supremacy of his Successors the favour of the Guru was invoked, and deemed indispensable for deliverance. Moreover, though gur parsâd does sometimes in the Granth Sâhib mean the Guru's favour, this appears to be more often expressed by gur parsâdi. 5. Bhi. There are two bhis in this line which some say are idiomatic. We have very little doubt that the first bhi is an obsolete past tense of the defective verb bhu, and that the verse ought to be translated 'The True One is, was, and also shall be.' Compare--'Guru Nânak, Shahu hai, bhi, hosi.' --Sûhi Ashtapadi 1. He is true now also, Nânak, and He also will be true. By thinking I cannot obtain a conception of Him, even though I think hundreds of thousands of times. Even though I be silent and keep my attention firmly fixed on Him, I cannot preserve silence. The hunger of the hungry for God subsideth not though they obtain the load of the worlds. If man should have thousands and hundreds of thousands of devices, even one would not assist him in obtaining God. How shall man become true before God? How shall the veil of falsehood be rent? By walking, O Nanak, according to the will of the Commander as preordained. By His order bodies are produced; His order cannot be described. By His order Souls are infused into them; by His order greatness is obtained. By His order men are high or low; by His order they obtain preordained pain or pleasure. By His order some obtain their reward; by His order others must ever wander in transmigration. All are subject to His order; none is exempt from it. He who understandeth God's order, O Nanak, is never guilty of egoism. Who can sing His power? Who hath power to sing it? Who can sing His gifts or know His signs? [1. Also translated--How shall the line of falsehood be broken? 2. Rajâi, the Arabic razâ, the divine pleasure. 3. In these two lines some suppose akâr to refer to the non-sentient, jiv to the sentient world. 4. That is, to be blended with God. 5. Literally-would not be guilty of saying haun main, i.e. I exist by myself independently of God. This is the sin of spiritual pride. 6. Also translated--Whoever has the power. Who can sing His attributes, His greatness, and His deeds? Who can sing is knowledge whose study is arduous? Who can sing Him, who fashioneth the body and again destroyeth it? Who can sing Him, who taketh away life and again restoreth it? Who can sing Him, who appeareth to be far, but is known to be near. Who can sing Him, who is all-seeing and omnipresent? In describing Him there would never be an end. Millions of men give millions upon millions of descriptions of Him, but they fail to describe Him. The Giver giveth; the receiver groweth weary of receiving. In every age man subsisteth by His bounty. The Commander by His order hath laid out the way of the world. Nanak, God the unconcerned is happy. What words shall we utter with our lips, on hearing which He. may love us? At the ambrosial hour of morning meditate on the true Name and God's greatness. [1. Châr is understood to be a contracted form of achâr. Some translate the word 'excellent,' and make it an epithet of wadiâi. Some that He is all-seeing and omnipresent. The Kind One will give us a robe of honour, and by His favour we shall reach the gate of salvation. He is not established, nor is He created. The pure one existeth by Himself. They who worshipped Him have obtained honour. Nanak, sing His praises who is the Treasury of excellences. Sing and hear and put His love into your hearts. Thus shall your sorrows be removed, and you shall be absorbed in Him who is the abode of happiness. Under the Guru',; instruction God's word is heard; under the Guru's instruction its knowledge is acquired; under the Guru's instruction man learns that God is everywhere contained. The Guru is Shiv; the Guru is Vishnu and Brahma; the Guru is Parbati, Lakhshmi, and Saraswati. [1. This verse is also translated--By our former acts we acquire this human vesture, and by God's favour reach the gate of salvation. The body is first formed, and then the soul from another body enters it. God decides in what body the soul is to have residence until the, body perishes. The acts of previous births are adjusted when the soul attains a human body. It is the acts done in human body which accompany the soul to future states of existence. 2. This verse is commonly translated--we shall then know that God is all in all Himself; but this translation does not appear to harmonize with the preceding part of the pauri. 3. Also translated--and you shall take happiness to your homes. (a) Under the Guru's instruction God's word is heard; under the Guru's instruction the knowledge of it is acquired; it is contained in the Guru's instruction. (b) The voice of God is found as well in other compositions as in the Veds; the voice of God is all-pervading. (c) The pious; know the Gum's instruction, that God is everywhere contained. (d) The voice of the Guru is as the Veds for the holy; they are absorbed in it. 5. The Hindu goddess of wealth and riches, consort of Vishnu, and mother of Kâm the god of love. 6. The goddess of eloquence and learning and patroness of arts and sciences. (a) He is greater than Shiv; greater than Vishnu and Brahma greater than Pârbati, Lakshmi, and Saraswati. (b) For the holy the Guru is Shiv; the Guru is Vishnu and Brahma; the Guru is Pârbati, Lakhshmi and Saraswati. God first created the sword, the emblem of Death, and then the world. If I knew Him, should I not describe Him? He cannot be described by words. That there is but one Bestower on all living beings; may I not forget Him! If I please Him, that is my place of pilgrimage to bathe in; If I please Him not, what ablutions shall I make? What can all the created beings I behold obtain without previous good acts? Precious stones, jewels, and gems shall be treasured up in thy heart if thou hearken to even one word of the Guru. If God's look of favour fell not on him, no one would notice him. He would be accounted a worm among worms, and even sinners would impute sin to him. But no such person is seen as can bestow virtue upon Him. By hearing the Name man obtaineth a knowledge of the Continents, the worlds, and the nether regions. By hearing the Name death doth not affect one. Nanak, the saints are ever happy. By hearing the Name sorrow and sin are no more. By hearing the Name man become as Shiv, Brahma, and Indar. By hearing the Name even the low become highly lauded. By hearing the Name the way of Jog and the secrets of the body are obtained. By hearing the Name man understandeth the real nature of the Shastars, the Simtritis, and the Veds. Nanak, the saints, are ever happy. By hearing the Name truth, contentment, and divine knowledge are obtained. Hearing the. Name. is equal to bathing at the sixty-eight places of pilgrimage. By hearing the Name and reading it man obtaineth honour. [1. Sûrs are spiritual heroes. 2. The bull which the Hindus believe supports the earth. This is not believed in by the Sikhs. See below, pauri xvi. 3. Man shall not die again, but obtain deliverance. 4. Also translated--On hearing the Name one is praised by high and low. By hearing the Name the mind is composed and fixed on God. By hearing the Name, the depth of the sea of virtue is sounded. By hearing the Name men become Shaikhs, Pirs, and Emperors. By hearing the Name a blind man findeth his way. By hearing the Name the unfathomable becometh fathomable. The condition of him who obeyeth God cannot be described. Whoever trieth to describe it, shall afterward repent. To describe the condition of him who obeyeth God. Whoever obeyeth God knoweth the pleasure of it in his own heart. [1. Or--by hearing the Name man easily meditateth upon God. 2. Also translated--man acquireth the best virtues. 3. Literally--he knows it in his own mind, that is, he obtains a pleasure which is incommunicable. The elect shed lustre on the courts of kings. The attention of the elect is bestowed on the one Guru. (a) By obeying Him man proceedeth not by the path of destruction. (b) Man proceedeth by the broad, not the narrow way. 2. This is explained to mean--does not wander in transmigration. 3. Panch, literally five. The number conveys the idea of selection. There is a Hindustâni proverb, Pânehon men Parameshwar hai, Where live are assembled, God is in the midst of them. Others say that panch refers to the live classes of persons previously mentioned-- those who walk according, to God's will, who know Him to be true, who praise Him, who hear His name, and who obey Him. 4. This is the interpretation of sohahi given by Bhâi Chanda Singh in his commentary on the Granth Sâhib. But the Creator's works cannot be numbered. Which supported by patience maintaineth the order of nature. Whoever understandeth this is a true man. What a load there is upon the bull! Beyond this earth there are more worlds, more and more. What power can support their weight? Have all been written with a flowing pen. Doth any one know how to write an account of them? What power and beautiful form are Thine, O God! Who hath power to know how great Thy gifts are? Whereby hundreds of thousands of rivers were produced. So powerless am I, that I cannot even once be a sacrifice unto Thee. Whatever pleaseth Thee is good. Thou, O Formless One, art ever secure. [1. Sût, the thread on which the world is strung. The Guru means by patience the adjusted balance of the world, everything being in equipoise. 2. Here Guru Nânak obviously rejects the Hindu story that the earth is supported by a bull. 3. We understand kût as the Arabic kuwwat. If kût be held to mean food, a meaning which the word so pronounced also hears in Arabic, the verse will be translated--Who knoweth the extent of Thy gifts of sustenance? 4. The Hindus believe this is Eko aham, bahu syâm, one, let Me become many. Numberless Thy silent worshippers who lovingly fix their thoughts upon Thee. So lowly am I, that I cannot even once be a sacrifice unto Thee. O Formless One, Thou art ever secure. Nanak thus describeth the degraded. So lowly am I, I cannot even once be a sacrifice unto Thee. [1. Also translated--Numberless are those who issue oppressive orders. Numberless Thy names, and numberless Thy places. Completely beyond reach are Thy numberless worlds. Numberless they who repeat Thy name with all the strength of their intellects. By the letters recorded on man's head his destiny is declared. He who inscribeth them on others, beareth them not on His own head. As He ordaineth, so shall man obtain. There is no place without Thy name. It is removed by washing with water. Apply soap, and the impurity shall be washed away. It is cleansed by the love of the Name. Men do not become saints or sinners by merely calling themselves so. (a) With their bodies reversed, that is, standing on their heads, it form of religious austerity practised in India. (b) They who try to describe Thee shall have to carry loads of sin on their heads. 2. Letters here appear to mean sacred literature. 3. Bân generally means custom. Here it is understood to be used for bâni, a word. The recording angels take with them a record of man's acts. It is he himself soweth, and he himself eateth. Nanak, man suffereth transmigration by God's order. Shall wash off his impurity in the place of pilgrimage, within him. All virtues are Thine, O Lord; none are mine. There is no devotion without virtue. The Pandits did not discover; had they done so, they would have recorded it in tile Purans. Neither the Jogi nor any other mortal knows the lunar day, or the week-day, or the season, or the month. Only the Creator who fashioned the world knoweth when He did so. How shall I address Thee, O God? how shall I praise Thee? how shall I describe Thee? and how shall I know Thee? [1. The verse is also translated--'Blessing on Thee!' is said to have been the first salutation that Brahma addressed Thee. Saith Nanak, everybody speaketh of Thee, one wiser than another. Great is the Lord, great is His name; what He doeth cometh to pass. 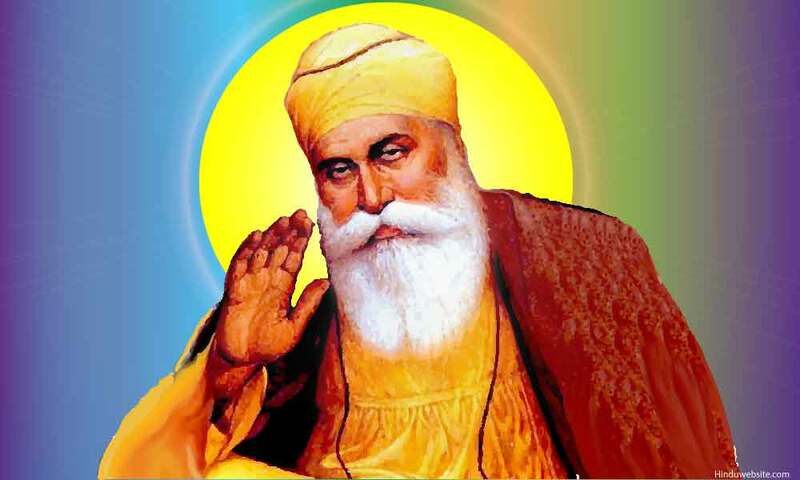 Nanak, he who is proud shall not be honoured on his arrival in the next world. There are hundreds of thousands of nether and upper regions. Men have grown weary at last of searching for God's limits; the Veds say one thing, that God has no limit. The thousands of Purans and Muhammadan books tell that in reality there is but one principle. If God can be described by writing, then describe Him; but such description is impossible. O Nanak, call Him great; only He Himself knoweth how great He is. As rivers and streams fall into the sea, but know not its extent. Are not equal to the worm which forgetteth not God in its heart. [1. The verse is also translated --The Veds have at last grown weary of searching for God's limits, but they cannot give the slightest description of Him. 2. There being only eighteen Purâns, the expression in the text means a thousand times eighteen or an indefinite number. The word sahans is also understood by the gyânis to refer to rikhis and learned men in indefinite numbers. 3. That is, that God is the root or principle of all things. There is no limit to God's praises; to those who repeat them there is no limit. There is no limit to His mercy, and to His gifts there. is no limit. There is no limit to what God seeth, no limit to what He heareth. The limit of the secret of His heart cannot be known. The limit of His creation cannot be known; neither His near nor His far side can be discovered. To know His limits how many vex their hearts. Great is the Lord, and exalted is His seat. His exalted name is higher than the most exalted. How great He is He knoweth Himself. Nanak, God bestoweth gifts on whom He looketh with favour and mercy. He is a great giver and hath not it particle of covetousness. How many, yea countless heroes beg of Him! How many pine away in sin! How many fools there are who merely eat! O Giver, these are also Thy gifts. [1. Also translated--There is no limit to the Praised One. 2. A metaphor taken from the banks of a river. 3. Billâh, literally, cry in pain. 4. Karm, in Sanskrit, is work; in Persian, kindness, favour, or bounty. The context seems to show that the latter is intended. Nobody can interfere with it. He shall himself know the punishment he shall suffer. O Nanak, is the King of kings. Priceless Thy mercy and priceless Thine ordinances. How beyond all price Thou art cannot be stated. Ever speaking of Thee men continue to fix their thoughts on Thee. [1. Band, to be enclosed in a womb. 2. Khâik. This word is also found in the Sri Râg ki Wâr, Slok 2--thâo nâhîn khâika, there is no place for the fool. Giveth the boon of praising and lauding Him. 4. In the true Name. 5. Also translated--Priceless is Thy love, and priceless they who are absorbed in it. 6. We read pramân for parwân. If the latter be read, the translation will be--Priceless Thy weights and priceless Thine acceptance of mortals. A third translation is--Priceless Thy scale and priceless Thy weights. That God is ever true, He is the true Lord, and the true Name. He who made this world is and shall be; He shall neither depart, nor be made to depart. Beholdeth His handiwork which attesteth His greatness. He will do what pleaseth Himself; no order may be issued to Him. He is King, the King of kings, O Nanak; all remain subject to His will. Make thy body, which is only a morsel for death, thy beggar's coat, and faith thy rule of life and thy staff. Make association with men thine Ai Panth, and the conquest of thy heart the conquest of the world. Unyielding heroes of true faith approved. The ages four and Veds to them assigned. This world of ours, high heaven, and hell below. And eight and sixty spots of pilgrims' haunt. The sources four from which all life doth spring. Created, cherish'd, and upheld by Thee! The hosts who wear the colours of Thy faith. Could ne'er be told by Nanak's lowly song. [1. Also translated--Creation shall depart, but not He who made it. 2. This and the following three pauris were composed by Guru Nânak after the Jogis had pressed him to adopt their dress and their religion. 3. This verse is also translated--Make the chastening of thy body not yet wedded to death thy patched coat, and faith thy beggar's staff. The primal, the pure, without beginning, the indestructible, the same in every age! keeper, and the voice which is in every heart the pipe to call to repast. Make Him who hath strung the whole world on His string thy spiritual Lord; let wealth and supernatural power be relishes for others. Union and separation is the law which regulateth the world. By destiny we receive our portion. One Maya in union with God gave birth to three acceptable children. One of them is the creator, the second the provider, the third performeth the function of destroyer. As it pleaseth God, He directeth them by His orders. He beholdeth them, but is not seen by them. This is very marvellous. [1. Adesh, the ordinary salutation of Jogis. This word is derived from âdi, primal and Îsh or Îshwar, God. Guru Nânak means that this salutation should only be offered to God. 2. Anîl--literally, not of a blue colour, as Kristian is represented. 3. Also translated--favourable and unfavourable destinies shape men's actions. His seat and His storehouses are in every world. What was to be put into them was put in at one time. The Creator beholdeth His creation. Nanak, true is the work of the True One. I would utter the name of the one Lord of the world hundreds of thousands of times with all my tongues. In this way I should ascend the stairs of the Lord, and become one with Him. On hearing of the exaltation of the religious the vile become jealous. Nanak, the former have found the Kind One, while false is the boasting of the false. I have no strength to speak and no strength to be silent. I have no strength to acquire empire or wealth which produce a commotion in the heart. I have no strength to find the way to escape from the world. He in whose arm there is strength, may see what he can do. Nanak, no one is of superior or inferior strength before God. [1. To supply human necessities. 2. That is, before man is born, his Portion is fully allotted him. 3. Literally--on hearing matters connected with heaven worms grow jealous. Wind, water, fire, and the nether regions. In the midst of these He established the earth as a temple. In it He placed living beings of different habits and kinds. And they are judged according to their acts. True is God, and true is His court. There the elect are accepted and honoured. The Merciful One marketh them according to their acts. The bad and the good shall there be distinguished. Nanak, on arrival there, this shall be seen. Such is the practice in the realm of righteousness. I now describe the condition of the realm of knowledge. How many winds, waters, and fires! how many Krishans and Shivs! How many Brahmas who fashioned worlds! how many forms, colours, and garbs! How many lands of grace like this! now many mountains! how many Dhrus and instructors such as his. How many Indars, how many moons and suns, how many regions and countries! How many Sidhs, Budhs, how many Naths! now many goddesses and representations of them! How many demigods and demons! how many saints, how many jewels and seas! How many sources of life! how many languages! and how many lines of kings! How many possessors of divine knowledge! now many worshippers! Nanak, there is no end of them. [1. The Hindus believe it was through the agency of Brahma God created the world. 2. Where men reap the results of their acts. In the realm of knowledge the light of divine knowledge is resplendent. There are heard songs from which millions of joys and pleasures proceed. Beauty is the attribute of the realm of happiness. There things are fashioned in an incomparable manner. What is done there cannot be described. Whoever endeavoureth to describe it shall afterwards repent. And there too is fashioned the skill of demigods and men of supernatural power. Force is the attribute of the realm of action. Incomparable are they who dwell therein. In whose hearts God dwelleth. They rejoice; the True One is in their hearts. God dwelleth in the true realm. He looketh on its denizens with an eye of favour, and rendereth them happy. There are continents, worlds, and universes. Whoever trieth to describe them shall never arrive at an end. [1. Sharm khand. Sharm is here not the Persian sharm, shame, nor the Sanskrit shram, toil. It is the Sanskrit sharman, happiness. The verse is also translated--Beautiful are the words of those who have attained the realm of the happy. 2. That is, the world. 3 Sita's name is apparently introduced here as she was the wife of Ram mentioned in the preceding line. 4 Na thâge jâh, literally--are not deceived. There are worlds upon worlds and forms upon forms. God beholding and contemplating them is pleased. Nanak, to describe them would be impossible. Divine love thy crucible, and melt God's name therein. In such a true mint the Word shall be coined. This is the practice of those on whom God looketh with an eye of favour. Nanak, the Kind One by a glance maketh them happy. Day and night are our two nurses, male and female, who set the whole world a-playing. Merits and demerits shall be read out in the presence of the Judge. According to men's acts, some shall be near, and others distant from God. Shall have their countenances made bright, O Nanak; how many shall be emancipated in company with them! [1. Literally --would be as hard as iron. 2. Here the denizens of the world are likened to children, Their father is said to be water, the human sperm; the earth like a mother affords them nutriment; day supplies them with occupation; the night lulls them to rest; and the breath of the Guru imparts divine instruction. In the East it is usual for the rich to have two nurses for a child--female nurse by night, and a male nurse to accompany and play with it by day. 3. The worship of God and the necessity of labour for one's livelihood are eminently Sikh principles.